Colorful Cocktails: Game Day Sangria! If you’re in the mood for something new and exciting to get you in gear for tailgating- look no further. 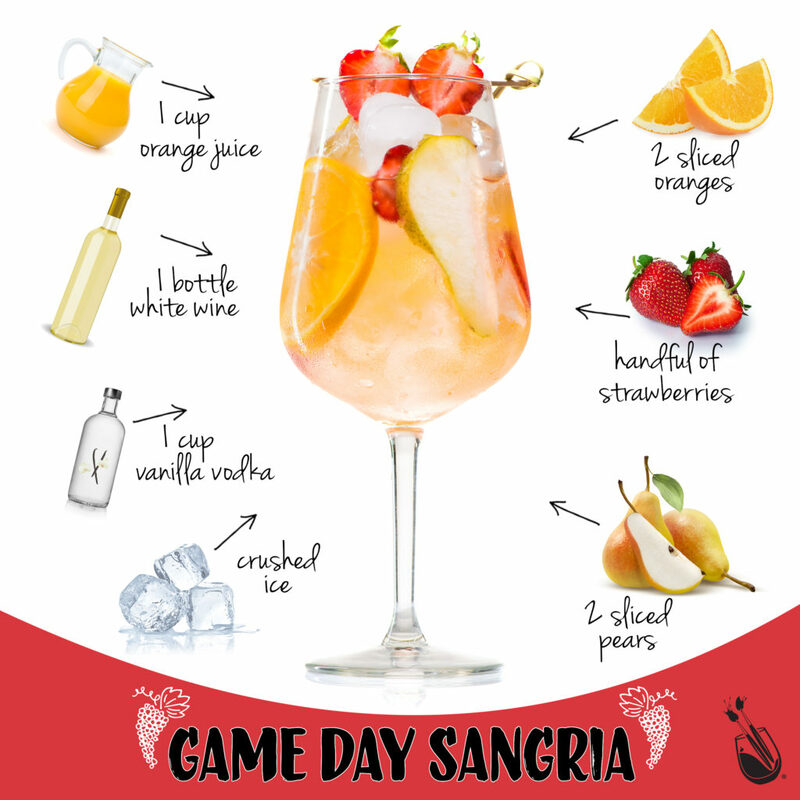 Inspired by the idea of hydrating, nourishing and amping yourself up for game day, this fruity sangria will transport you to a place between summer and fall where weekends are filled with promise and FOOTBALL! Make everyone happy and whip up a batch of this creamsicle inspired Sangria- with a sweet and tangy fusion of summer and fall fruits. It’s perfect to satiate any palate with a refreshing zing! Game Day Sangria isn’t just for afternoons before the big game, it’s DELICIOUS enough to make in a Painting with a Twist studio for a Friday night class! There’s no better way to celebrate a girl’s night out than a paintbrush in one hand and a Game Day Sangria in the other. Fill pitcher with crushed ice. Add wine, vodka, and juice. Stir. Slice oranges and pears into quarters. Add fruit into pitcher mixture. Serve in wine glasses, making sure to scoop fruit out into each cup! 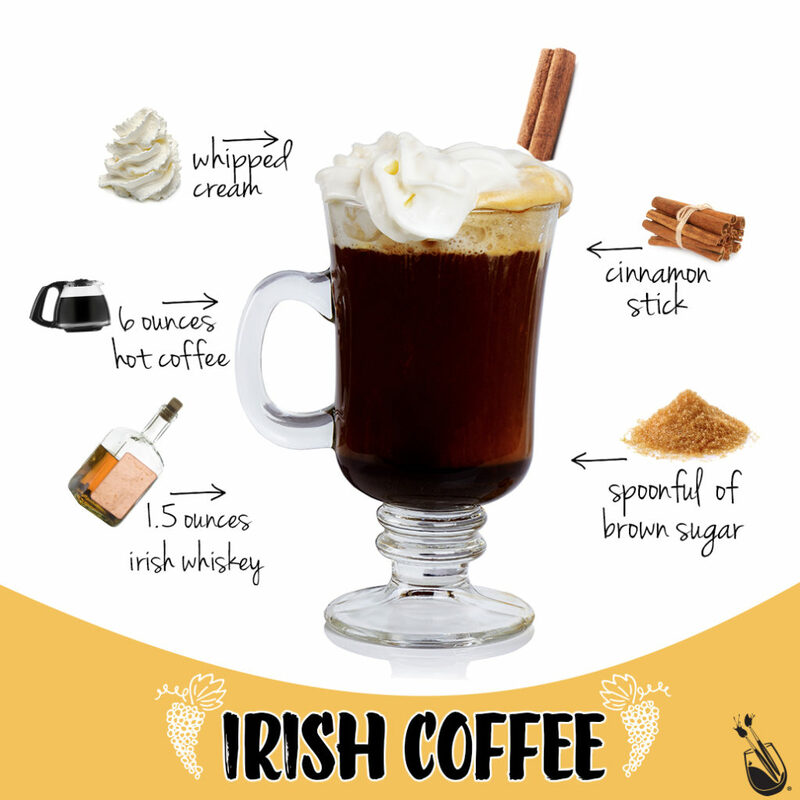 #NationalIrishCoffeeDay is this week and we couldn’t be more excited to talk about our favorite Irish Coffee recipe. There isn’t much to dislike about this steamy and sweet concoction. It’s the perfect blend to help you relax with a drink and wake up with a jolt! Not to mention, it almost always comes with whipped cream. This Colorful Cocktail recipe is classic. When it comes to Sangria recipes, we like to get a little creative – but the Irish Coffee needn’t be complicated. Simple ingredients make this toasty cocktail shine on a dreary winter’s day. However, if you prefer a little more flavor, there are endless recipes available at your fingertips. Like The Spruce’s creamy caramel recipe or Genius Kitchen’s rich, dark mocha recipe that hides a hint of Creme de Menthe for the most luxurious touch ever. Pro tip: Get really creative and add some snazz with a dollop of colorful whipped cream on top instead of the usual white. Our favorite color to make is PINK! It’s an easy way to achieve a striking (and fun!) result. Pour 1.5oz of Irish Whiskey into your glass. Top with 6oz of freshly brewed hot coffee of your choice. Stir in 1 tbsp of brown sugar. Top with a generous amount of whipped cream. December 20th is National Sangria Day and we have a classic recipe to lift your holiday spirit. Christmas is a wonderful time of year to gather with the ones you love to share stories, eat fabulous food, and clink wine glasses together for a toast around the fire. Recipes are kept sacred and treasured this time of year. Everyone has a favorite – buttery sugar cookies, savory cheese straws, intricate casseroles, the list goes on and on. We look forward to these tasty treats all year so why not pair them with cocktail that tastes as inspiring as it looks. 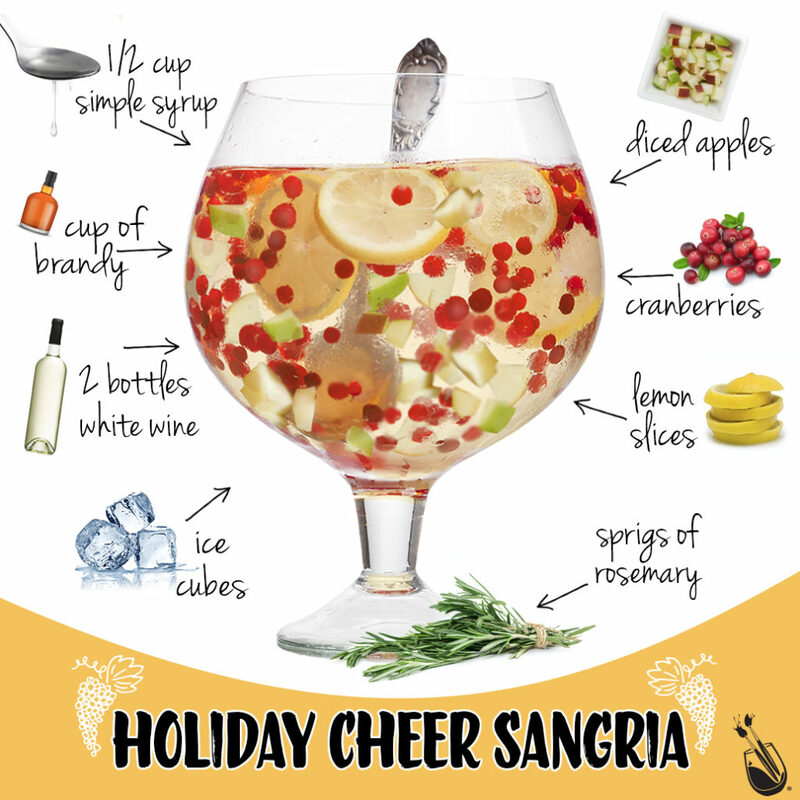 Introducing, Holiday Cheer Sangria. In celebration of National Sangria Day, we are sharing our favorite version of Holiday Cheer Sangria with you. This white wine version is fresh and crisp, just like the weather. For those who favor spicy reds, substitute with your favorite cabernet and garnish with a cinnamon stick for a wintry cocktail that’ll warm your heart. For a tarter take, use a beautifully pink hued White Zinfandel with a few orange slices as a garnish for a jammy and sweet Sangria. To make simple syrup, bring equal parts water and refined sugar to a boil. Stir frequently. Let cool before using. Fill large serving bowl with ice. Add white wine, brandy, and simple syrup. Mix well. Dice apples into small pieces and add to serving bowl. Wash cranberries well and add. Scoop out 1 cup worth for your guests and garnish with a sprig of Rosemary. Thanksgiving Sangria is here to make us feel warm, cozy, and grateful this holiday season. It’s deliciously enchanting and the barrage of fruit packed into a glass pitcher makes for a gorgeous tabletop addition. Anyone can make this simple recipe that pairs perfectly with a warm helping of apple pie or homemade stuffing. 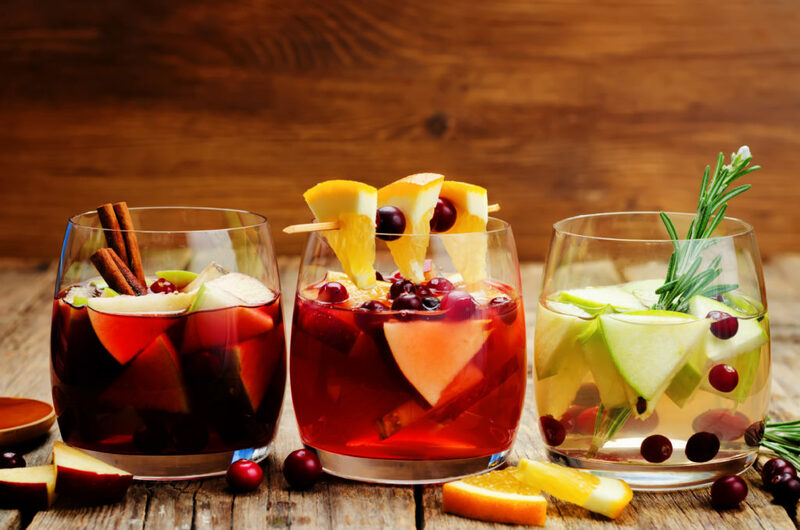 Everyone makes Thanksgiving Sangria a little differently. Our favorite is a twist on the classic recipe. Add some seasonal cranberries and pinch of Allspice for a bountiful red wine Sangria. Not into the reds? 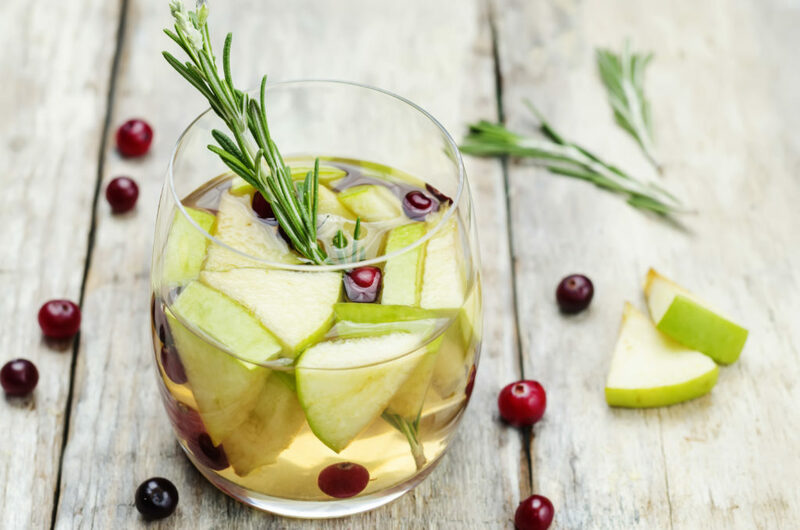 Try this White Sangria recipe where they use autumn ripe Granny Smith Apples and Barlett Pears to compliment a sweet Moscato. Want something with a bite to it? 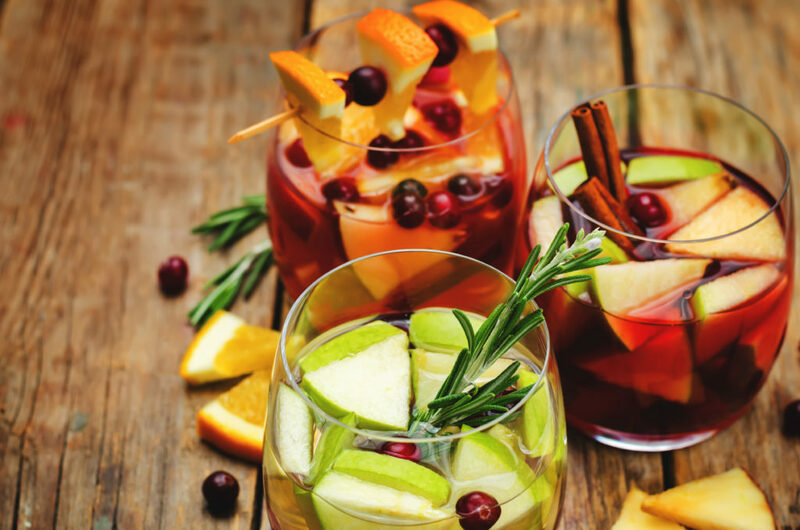 Apple Cider Sangria has hints of caramel and ginger that will put you in a very thankful mindset. 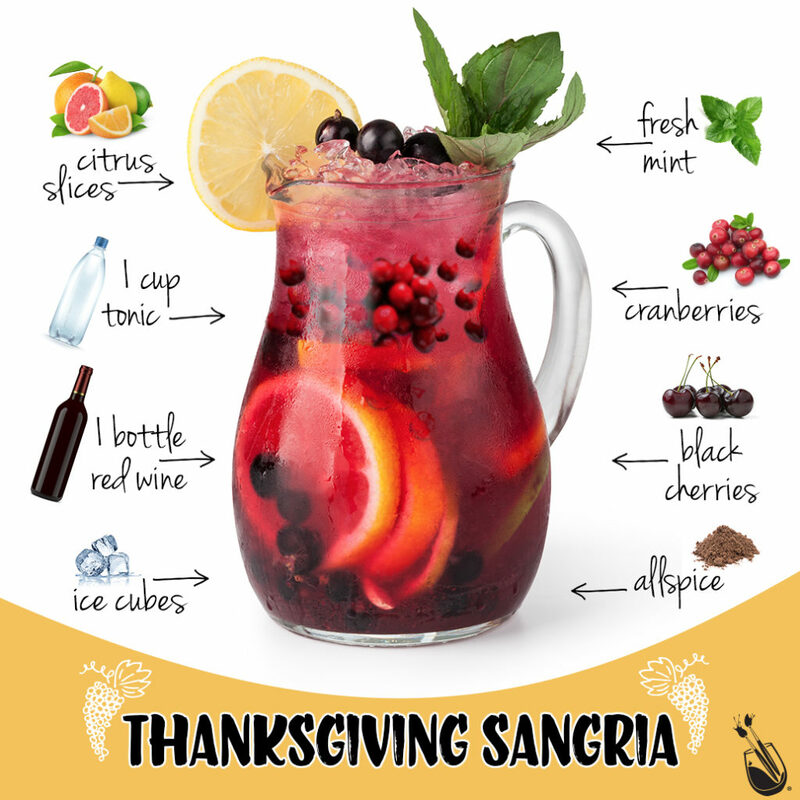 Thanksgiving dinner won’t feel complete without a fruity and spicy Thanksgiving Sangria to wash it all down with. Pour yourself a cup, let the satisfaction wash over you, and don’t forget to tell the people in your life why you appreciate them. Happy Thanksgiving, Twisters! Fill pitcher halfway with ice cubes. Add citrus, cranberries and black cherries. Pour in the bottle of red wine. Add Allspice and mix with spoon. 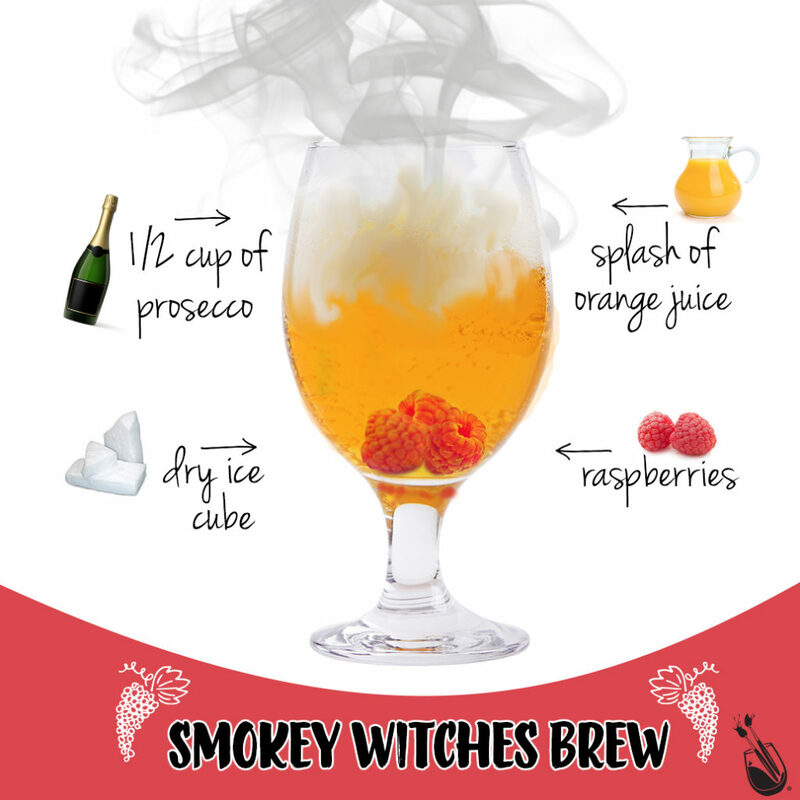 Introducing, the Smokey Witches Brew: Pop. Clink. Fizz. Plop. Then, watch as the tendrils of smoke curl over the lip of your goblet. Halloween is right around the corner and the time for serving up spooky cocktails is slowly running out. If you’re looking for the perfectly simple, yet perfectly delicious cocktail to make this Halloween, then look no further! A mimosa crafted to look like a magic potion is the answer. It’s ideal for the person who plans ahead AND for the person who waits until the day before Halloween to pick out a costume and cocktail sipper. Keep it simple, we say. The easier, the better. Luckily, a goblet full of Smokey Witches Brew is only a twisted version of the classically favored Mimosa! Adding a lump of dry ice is the most important ingredient. Use a pair of tongs(never touch dry ice with your bare hands!) to plop the dry ice cube into your colorful cocktail and watch it bubble over with spooky swirls of smoke. Not a fan of the classic Mimosa? Add any juice you want. A lemon-lime soda could be a nice addition, too. 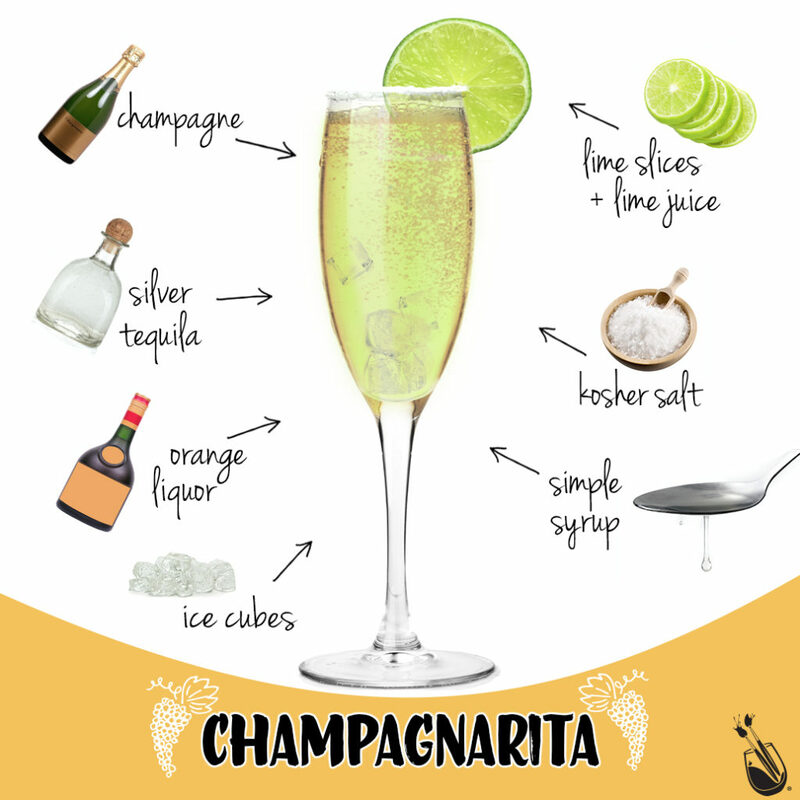 This recipe uses sparkling apple juice as a substitute for champagne to make it a fun and kid-friendly refreshment. Flavor possibilities are endless when it comes to personalizing your Smokey Witches Brew colorful cocktail. Country Living breaks down 29 fruity recipes inspired by the mimosa – All of which would work delightfully well to create the same smoldering cocktail that is creative and creepy enough to impress anyone. Happy Halloween, Twisters! Pour ½ cup Prosecco into a goblet. Drop in a handful of frozen raspberries. **Caution your guests not to drink the dry ice cubes. Read Betty Crocker’s advice when it comes to using dry ice in Halloween cocktails. On National Coffee Day, we want to celebrate coffee the best way we can imagine- cocktails! Really though- what would we do without our daily cup of joe? We depend on it to give us the strength to face the day. Our work days are split into coffee breaks with our peers. Our weekends are held together by long conversations over a full mug or grabbing a massive coffee to go before a new adventure. We drink it all day, every day. It’s delicious, after all. Coffee has found its way into our lives as a necessity. Thankfully, there is a great way for us to appreciate the uber-important beverage that fuels our hearts, minds, and bodies. 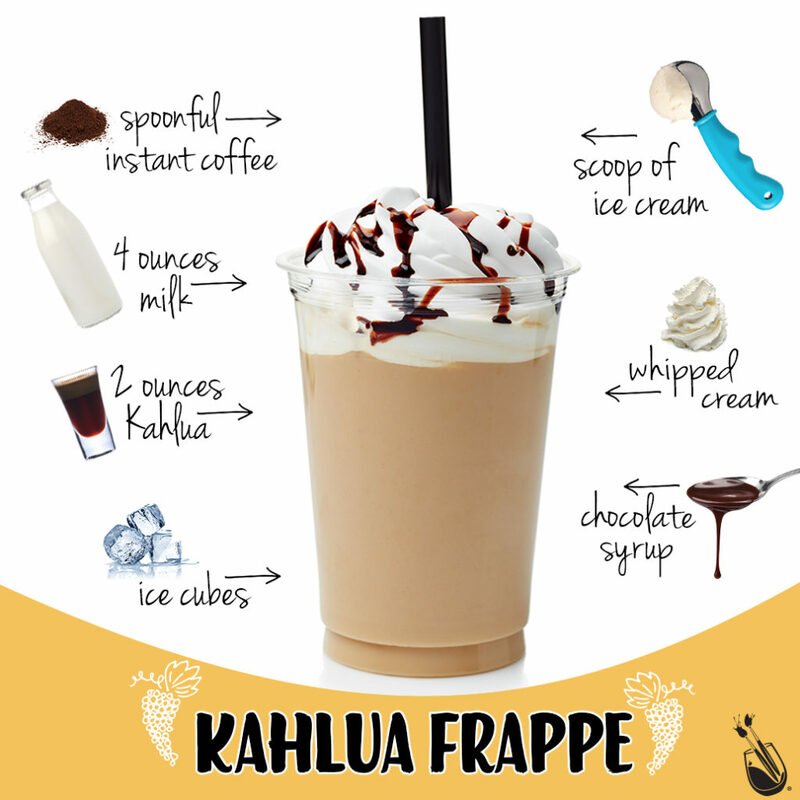 Our recipe is a boozy frappe will transport you to a decadent dessert paradise! The best thing about frappes is how they taste, but the second best thing is how easy they are to change up. Our personal favorite is this version: a no-frills recipe that takes you straight to flavor town. But feel free to get a little crazy. You could try a salted caramel version, like this recipe from The Cook Craft Love blog. It’s a lush retreat into a frozen paradise of french vanilla and creamy caramel. Add extra chocolate syrup in with the Kahlua and bring some mocha madness to your mouth. Drinkwire lays out a whole list of amazing frappe recipes(amazing as in… Pumpkin Spice Frappe!) Add Kahlua and voila… cocktails! Take “treat yourself” to the next level: Blend up a batch and grab a paintbrush! You and your friends seriously deserve an icy pitcher of frappe cocktails. Happy National Coffee Day, Twisters! Add Kahlua, milk, instant coffee and ice cream. Transfer to blender and pulse for 20 seconds. Pour back into glass and top with whipped cream. 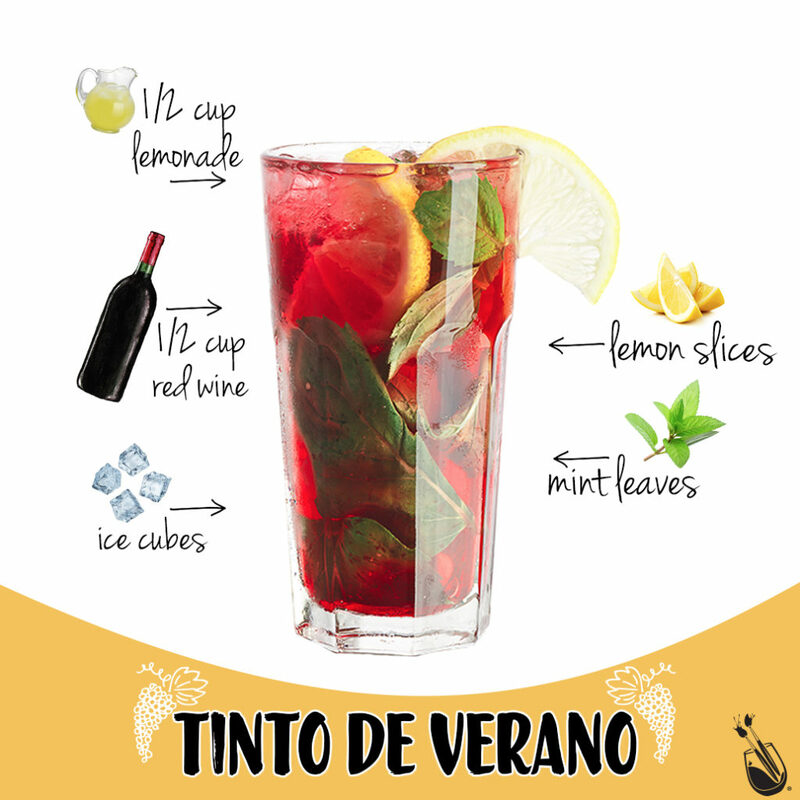 At Painting with a Twist, we love a good twist in our cocktails, making the Tinto De Verano a perfect sip for any painting class. This simple and refreshing colorful cocktail is a fan fave! Originating from Spain, this red wine-based drink is similar to a Sangria but with a twist of lemon. With a splash of lemonade, a twist of lemon, and muddled mint, this cocktail is sure to be a fan favorite for all! Many also call the Tinto de Verano the “Red Wine of the Summer.” Summer may be coming to a close where you are, but this cocktail will help you relish in the memories of summertime. This cocktail also has less alcohol in it, making it a perfect beverage to paint with! There are several versions of the Tinto to choose from! This recipe featured on The Spruce recommends adding lemon-lime soda instead, which, frankly looks super yummy too! The leaves are turning and there’s a special feeling in the air anticipating the cozy nights and brisk days ahead. Here’s a delicious colorful cocktail to celebrate the changing of the seasons- going from summer to autumn feels like a major shift. It seems like the perfect time to ditch the summer fruits and embrace the delicious flavors of fall. At Painting with a Twist, we love trying new colorful cocktails that embody every time of year. What’s the best way to welcome the changing leaves? 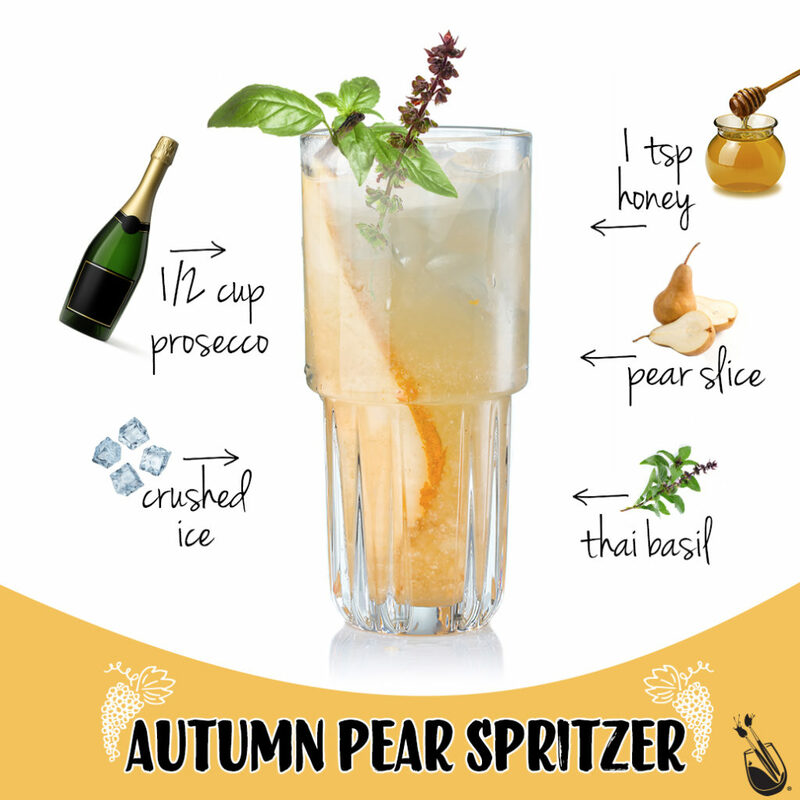 A toast to the good life with an Autumn Pear Spritzer. Drizzle 1 tsp honey into ice and stir vigorously with a spoon to distribute evenly. Fill with ½ cup of prosecco. Push sliced pear into the drink along the side of the glass. Slap basil between palms to release flavor. Additionally, this recipe is simple enough to pack up and bring to your next paint and sip class or perfect for sipping on the patio at dusk. While this palette satisfying colorful cocktail is our own brainchild, we couldn’t help but take inspiration from the Lemon Tree Dwelling’s recipe for the Pear Prosecco Spritzer. Is basil not your thing? Maybe you have a heart for amaretto? If so, here’s a perfect recipe that is similar. Maybe even give them both a try to see what you like most. Cheers!! Summer sunsets last deep into the evening. It’s the biggest thing I’ll miss once Autumn rolls around. It’s as if the summer days are patient- they wait for you to finish everything before the stage is set. Then the sunsets start small before they explode into a vibrant glow, like streaks highlighters across the sky. Every week, I try to carve out enough time to drink it in all its splendid color. Make the most of it by drinking in an equally beautiful colorful cocktail… maybe even a Sangria. It takes sunset watching to the next level, I promise. Imagine it now: You’re gathering with loved ones on the front porch to watch the sunset fade from a soft pink to a blazing orange that soaks into the entire sky while sipping on this colorful cocktail. It’s sweet, but not too sweet. And it’s icy cold refreshment makes you forget about the heat left over from the afternoon. Breath in the view, drink up the color. Let the stress of the day fall out of sight, even if momentarily. When I am here, this moment is my bliss. 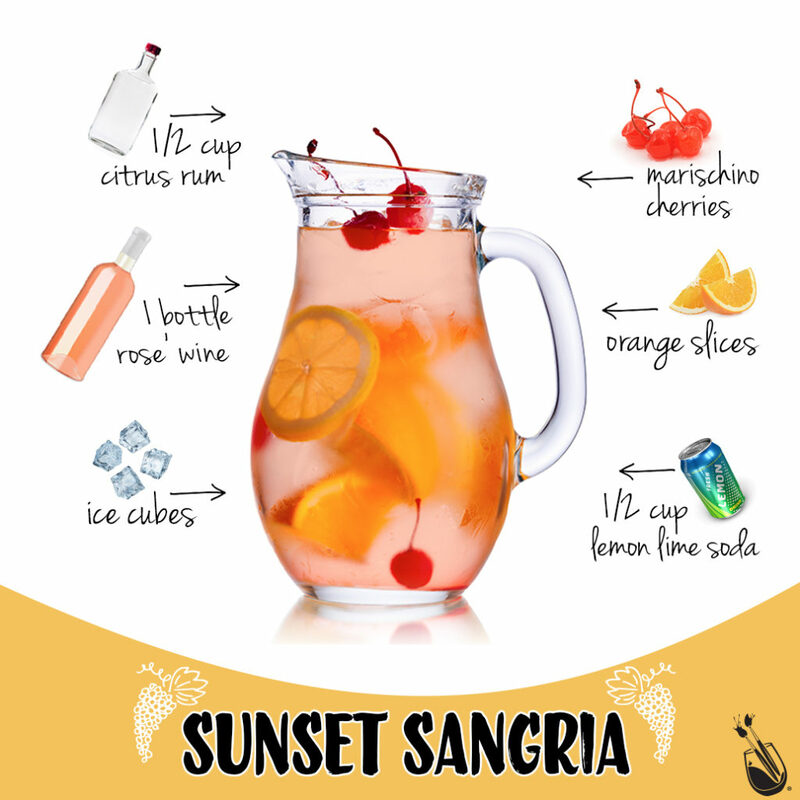 We put together our favorite recipe for a Sunset Sangria, inspired by these from Rachel Ray. Our version is a Rose’ Sangria – with a hint of rum for a kick. It’s filled with bright red cherries and thick slices of fresh tart oranges.This recipe makes a batch of slightly effervescent sangria that tastes like the colors of a sunset. 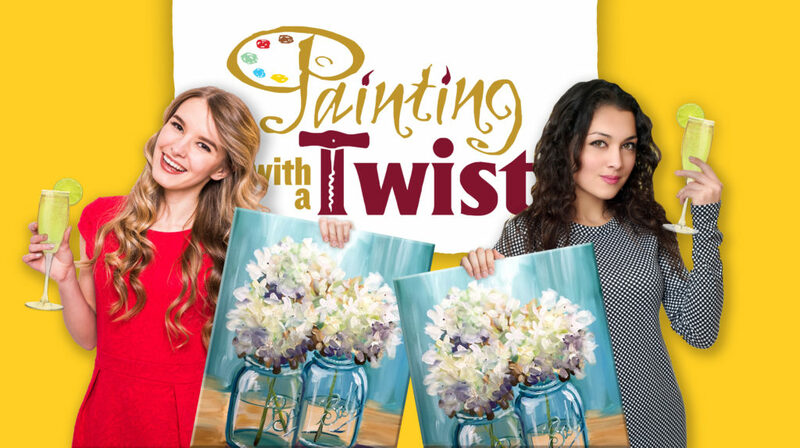 It can be mixed up for any occasion: watching the sunset, picnics on a hilltop, backyard bbq’s, or a girl’s night out at Painting with a Twist. You can paint your sunset and drink it, too! Fill pitcher ¾ full of ice cubes. Pour in rose’, citrus rum, and soda. Drop in cherries and orange slices.